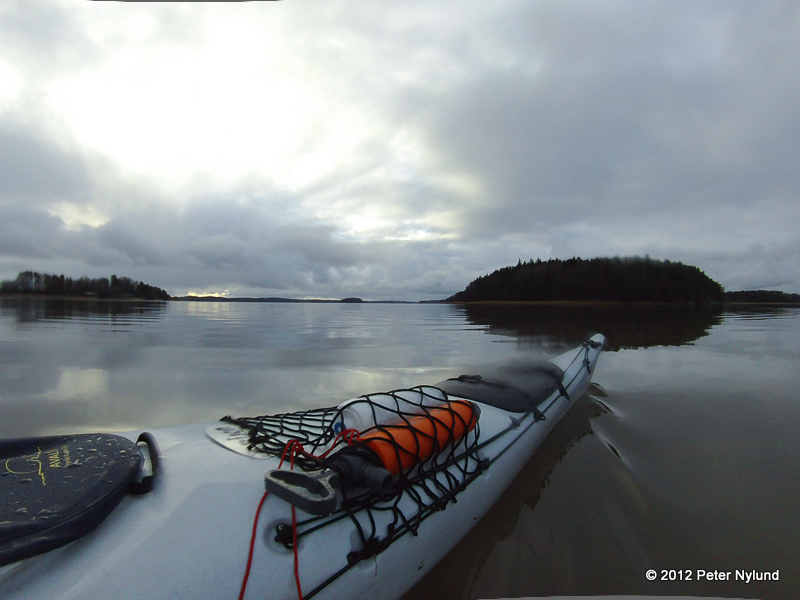 I recently bought a kayak after not doing any active kayaking for seven years. 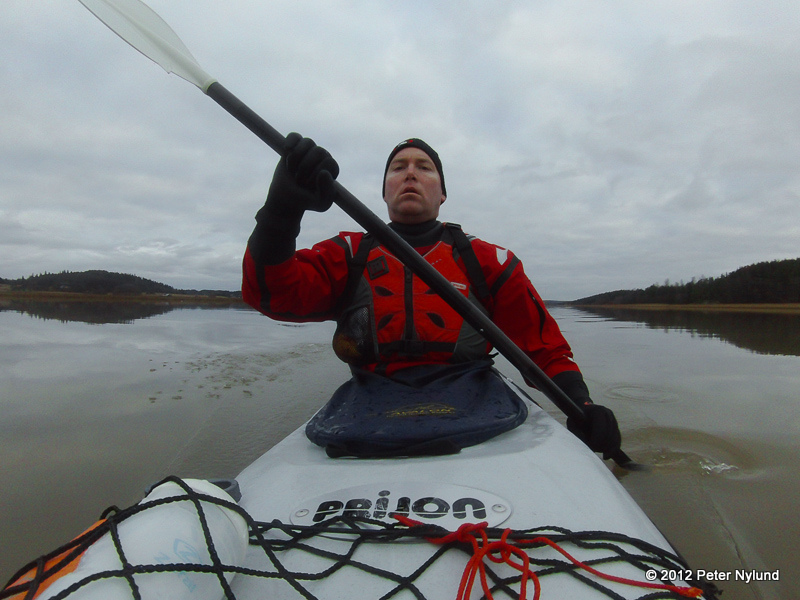 The main reason I quit sea kayaking back then was a back injury (a badly herniated disc between L4 and L5), which did limit me for some time and still makes it impossible to run frequently on harder surfaces. Additionally, with two small kids under two years old at the time, I didn't have the time for it. Nowadays my back is a lot better and while my family still mostly takes precedence over my own selfish pursuits, I do have a little more time available. 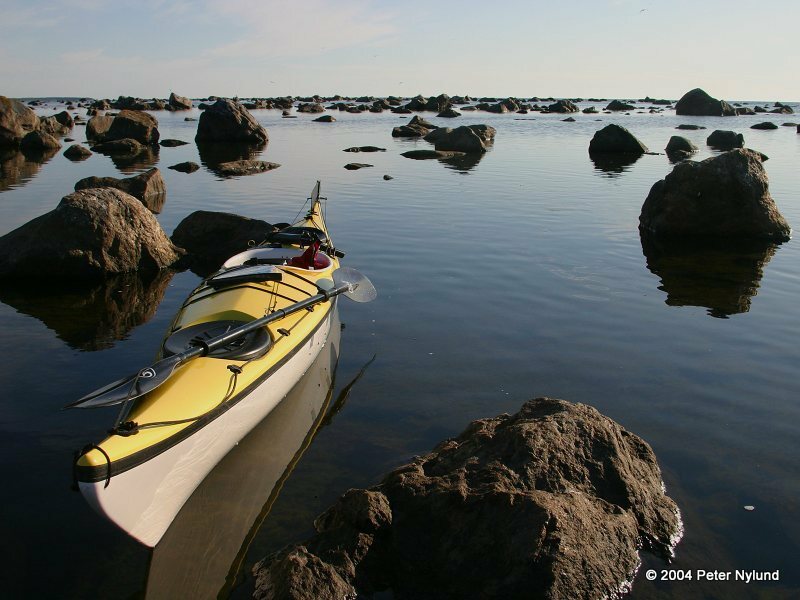 During the fall, the idea of to do some kayaking again matured, and I started to search the internet to see if anything interesting had developed during the time I hadn't followed sea kayaking very closely. I had a fairly good idea of what I wanted. 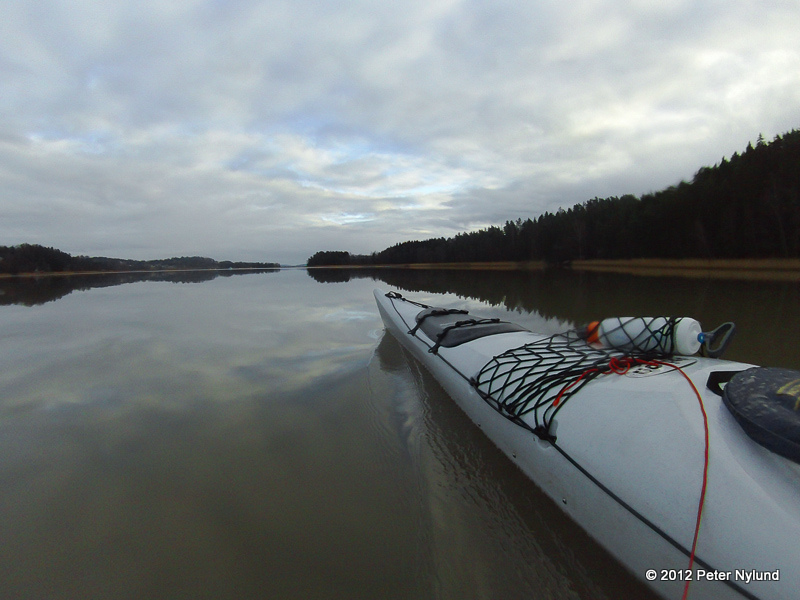 A composite kayak was no longer my first choice, since I would like to do some more kayaking in the stony waters of Osthrobotnia in Wester Finland. 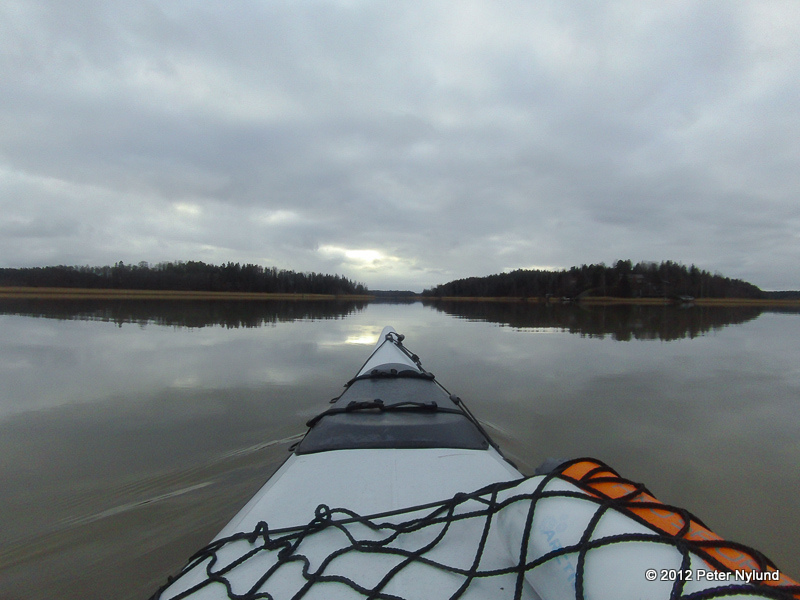 Check out the picture below to see why a composite kayak is not the first choice in that area (that kayak is the one I previously had). 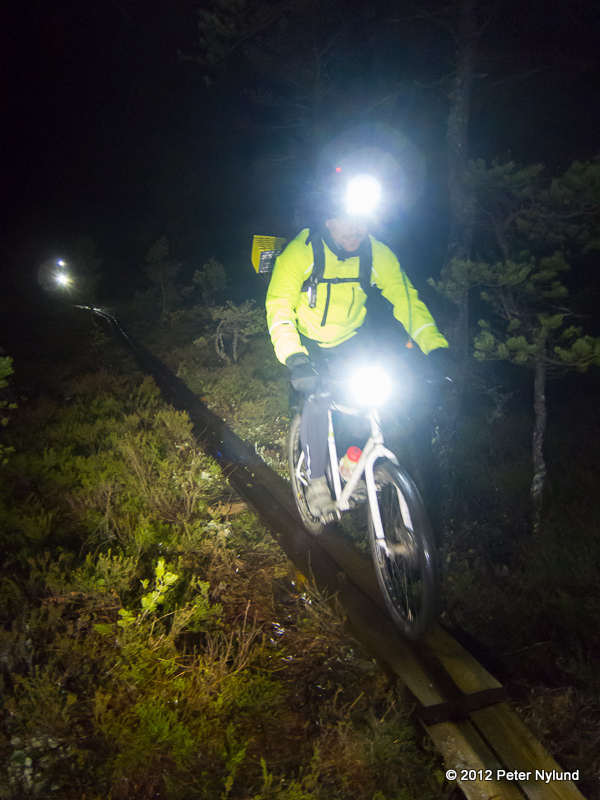 Some more googling showed that the best choice of material for my intended use still seemed to be Prijon's HTP plastic, which is a lot stiffer and durable than other plastic alternatives and in a totally different league than composite materials. The only downside of this material is the weight, which means that a kayaking weighing 25 kg in fiberglass would weight about 28 kg in HTP. 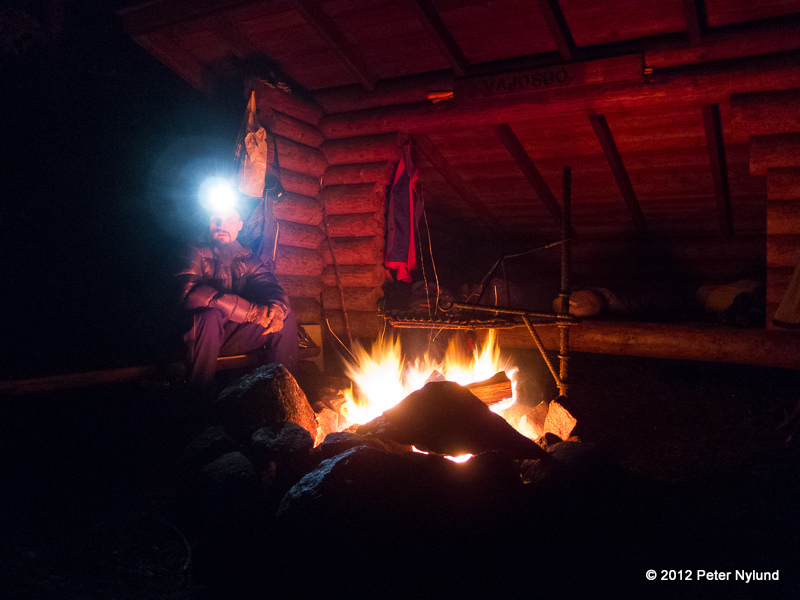 Checking out the Prijon models two or three alternatives were found, and when a used Prijon Kodiak became available locally the choice became quite easy. 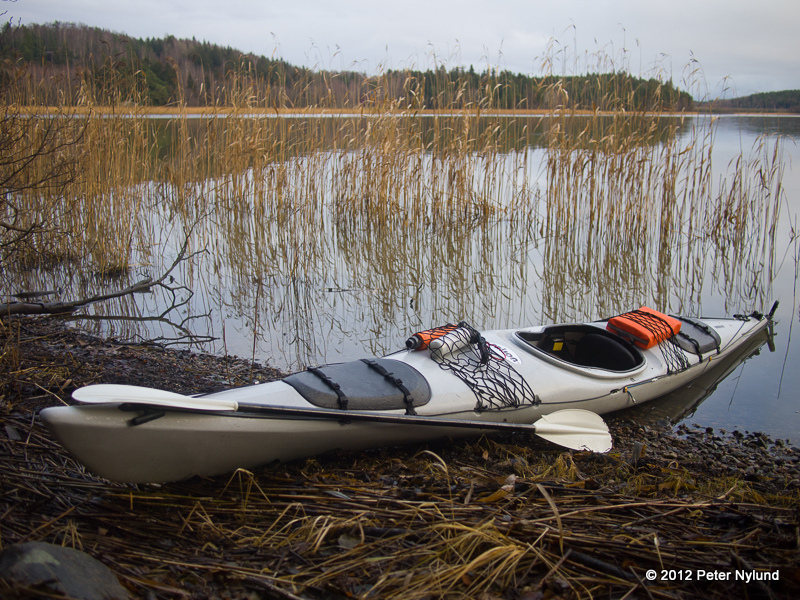 The Prijon Kodiak is a high volume expedition kayak and has been used for some serious expeditions in difficult conditions. As such, it has an unnecessary high load capacity for me. 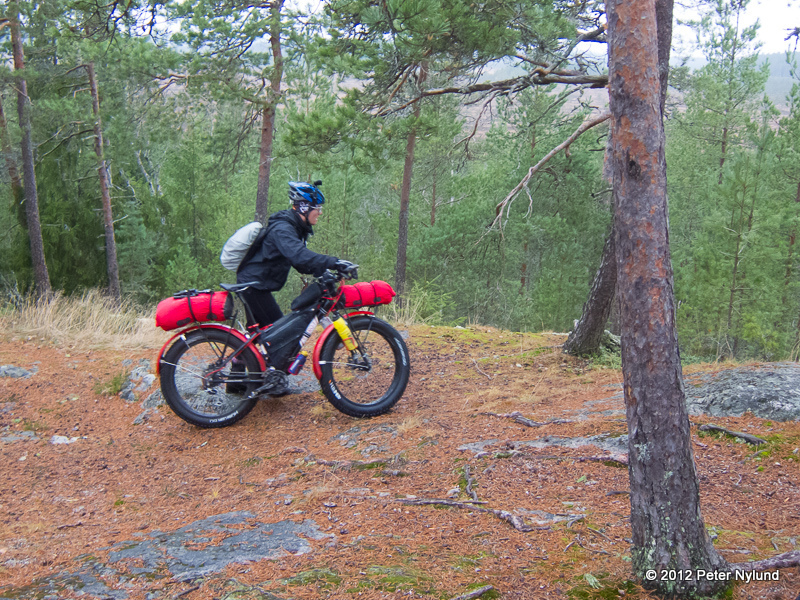 Being used to bikepacking and having the gear and knowledge to be totally self sufficient for a week of bikepacking with less than 15 kg of gear and food, the Kodiak's 50 kg of loading capacity, excluding myself, certainly is more than enough. The main disadvantage of this is that it floats unnecessary high in the water, making it less stable and more sensitive to wind. 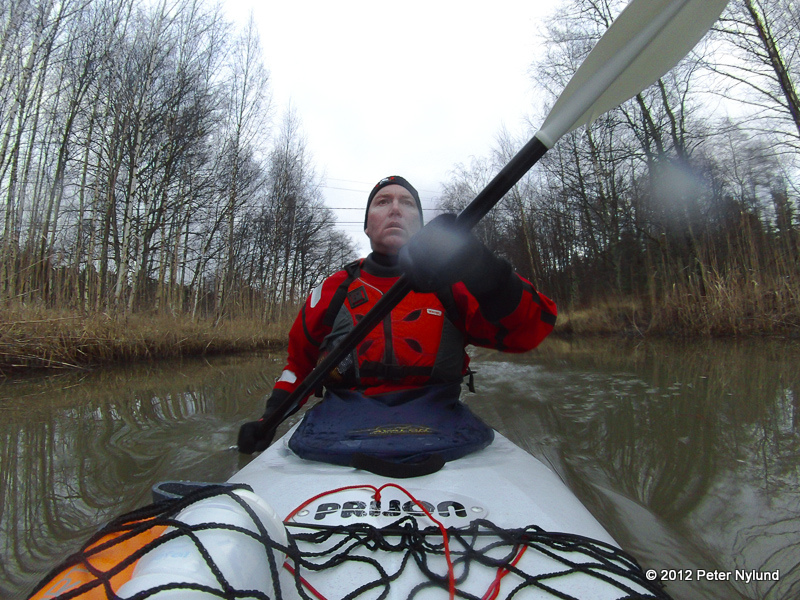 With my height (192 cm) and shoe size 46 I don't fit into much smaller kayaks, though. The Prijon Marlin HTP version could have been an option, but it is no longer made and would probably be hard to find used. 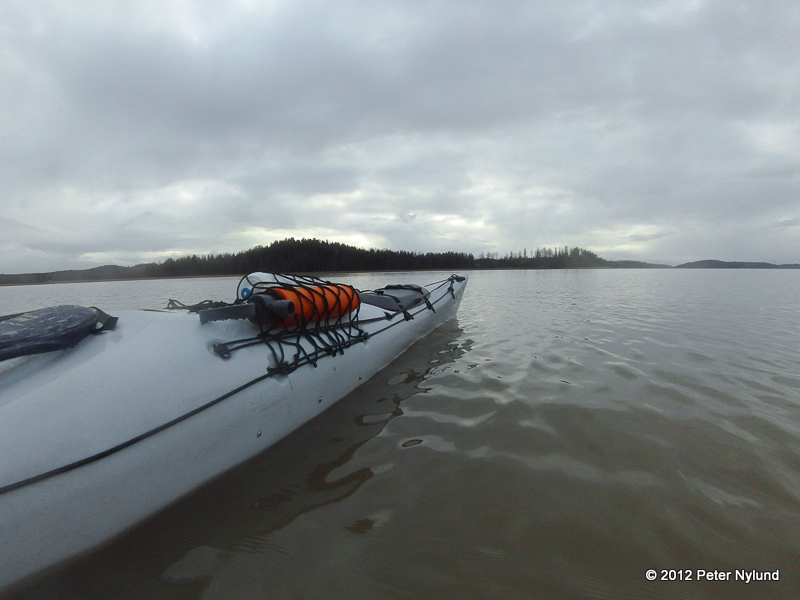 The Prijon Yukon, also no longer made, would probably be easier to find used and is probably the most versatile kayak available. I don't think it would have been fast enough for me, though. The other Prijon models are not big enough for me. 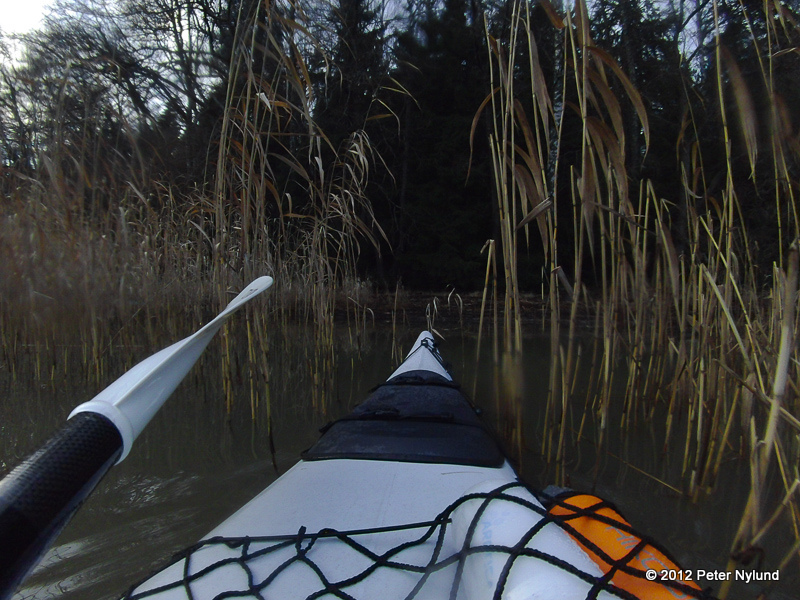 While waiting for the winter to arrive, it occurred to me that there was no reason not to go out and test the kayak. 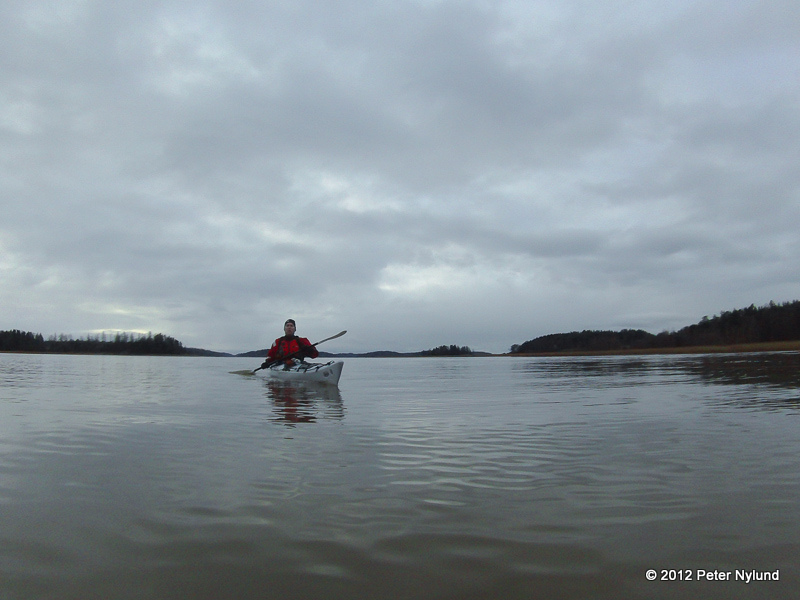 Today I had some time for that and paddling around Kuusisto seemed like a good option. I started in a grey November drizzle, but soon the cloud cover became less uniform. 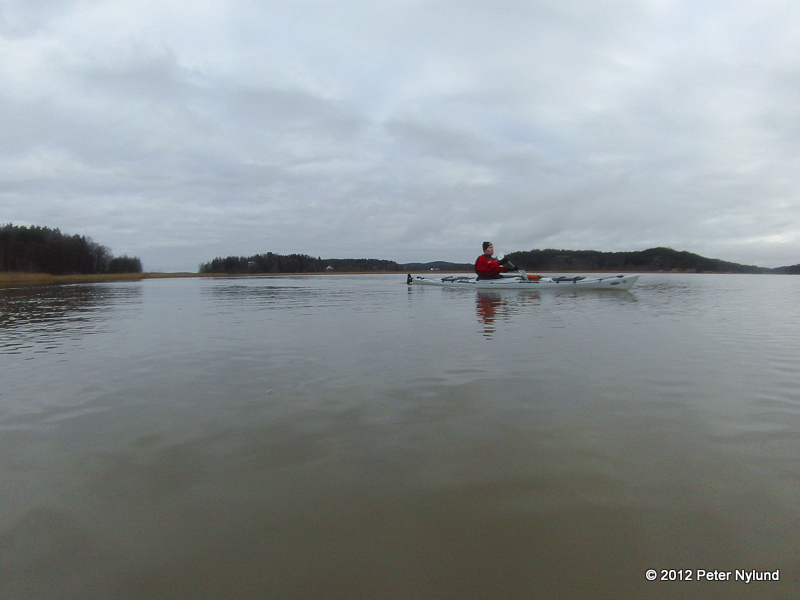 The air temperature was 4C and the water temperature was probably close to that. 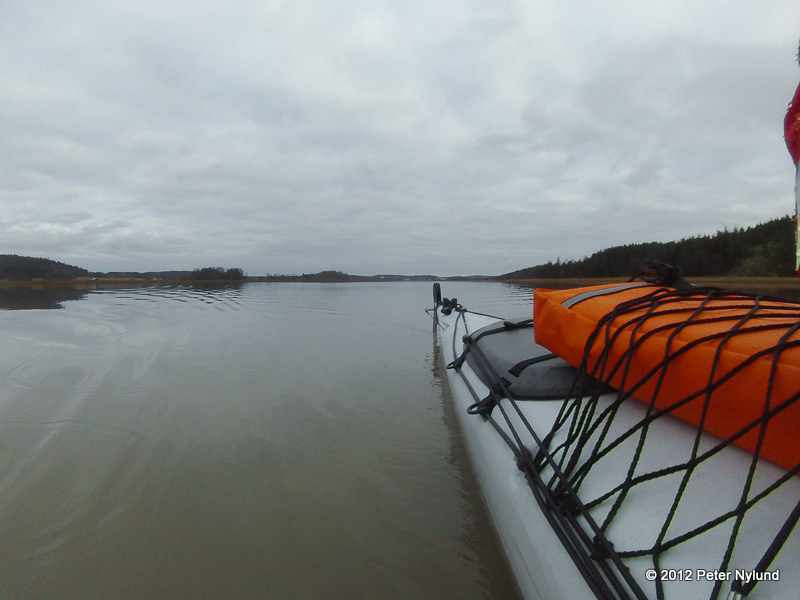 Hence the water was cold enough that a drysuit was the only reasonable clothing to have, since in case of an (unlikely) capsize the situation would otherwise quickly become very dangerous. 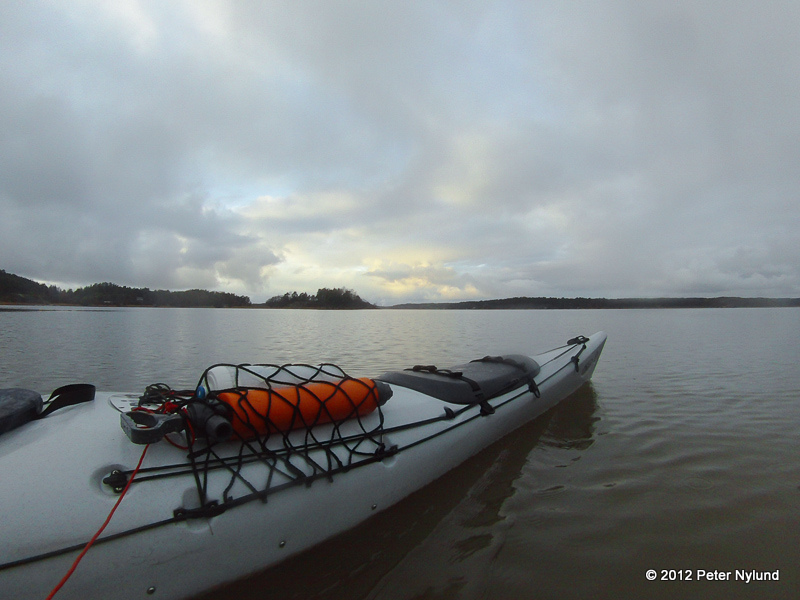 The kayak certainly felt stable enough, despite some very contradictory information on internet. 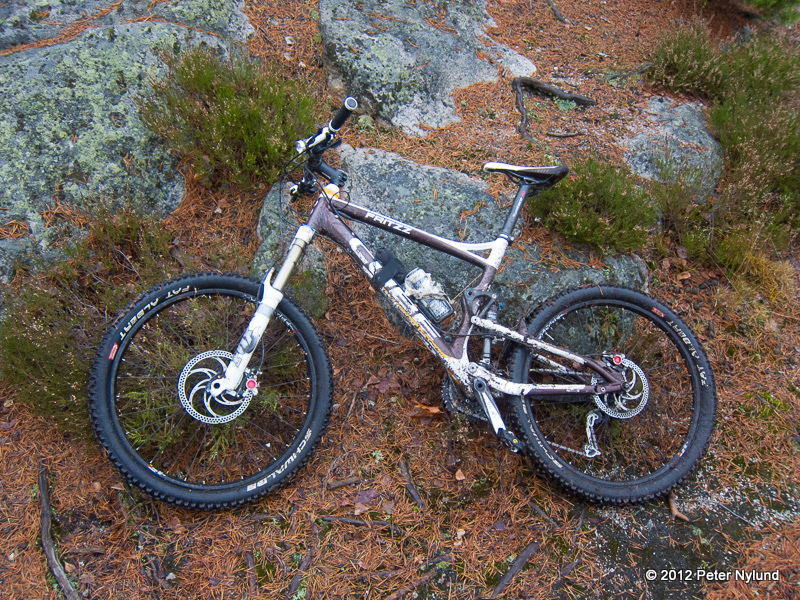 It is hard to say anything about the speed, but the Prijon Kodiak is supposed to be pretty fast. There was no wind and the light and everything felt very Novemberish, though not in the worst possible sense. 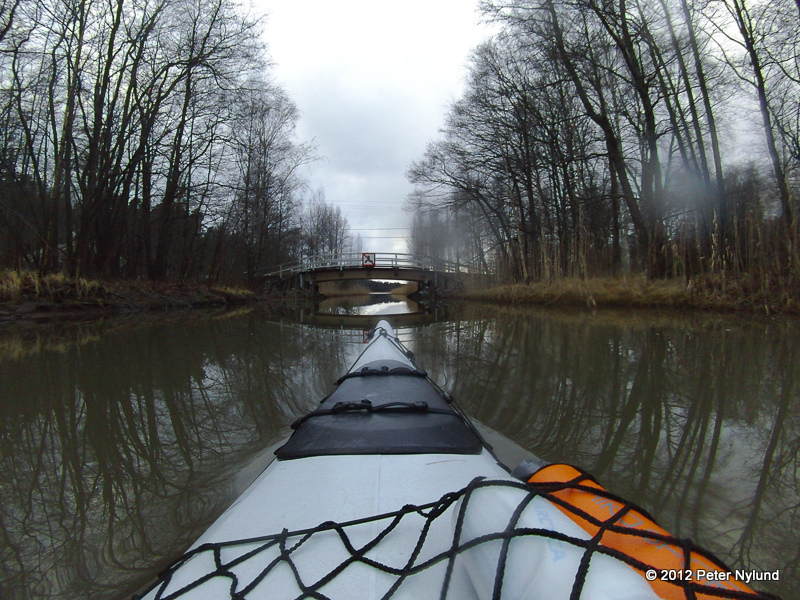 Returning for the camera, which I had on a paddle float. After almost three hours I closed in on the island that I was to spend a small coffee break on. 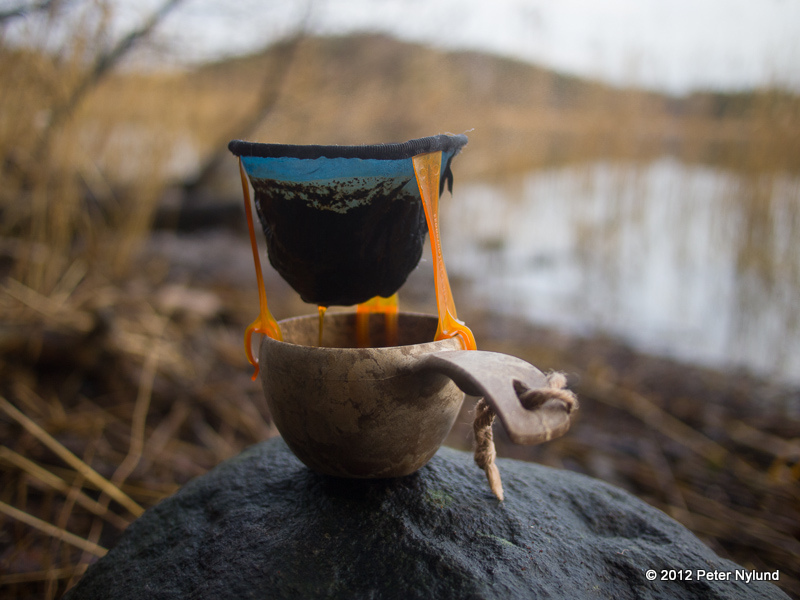 Since I bought this kayak for shorter or longer tours, and not for exercise, the coffee was more than just coffee, it also had a symbolic significance. 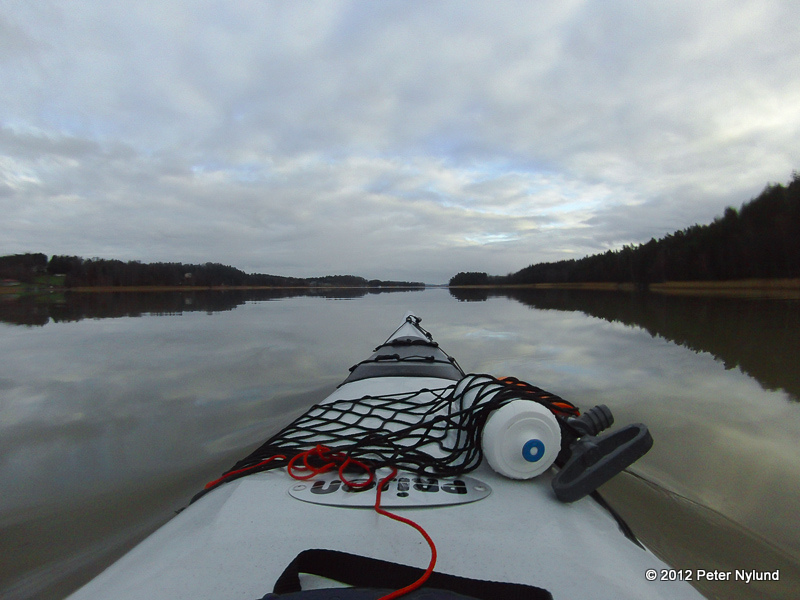 After the short break, I continued and had about one hour of paddling left. Sunset in less than one hour. 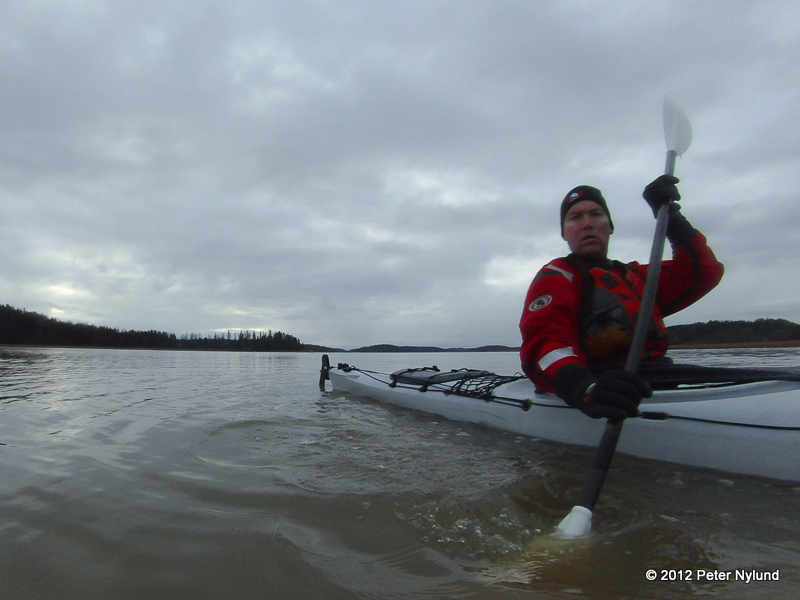 After four hours of actual paddling and around 25 km I was back where I started. 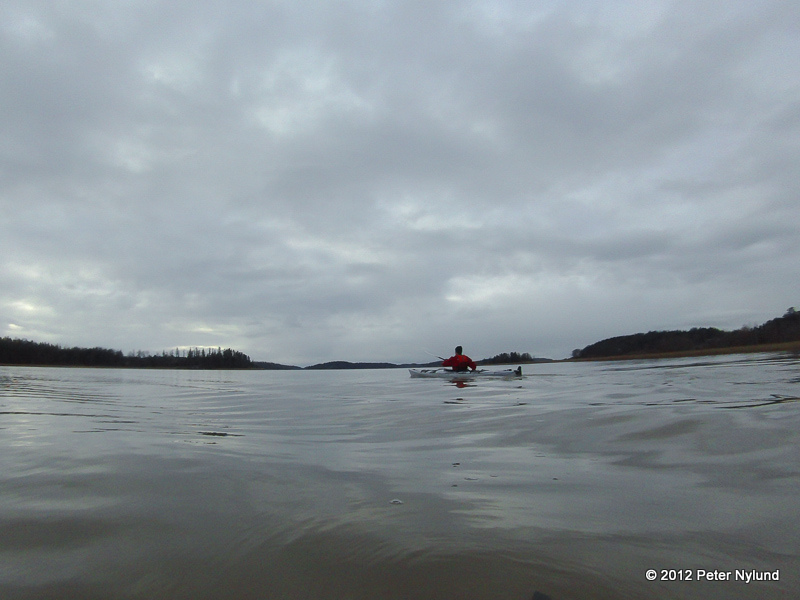 Despite doing only very sporadic paddling for seven years, paddling felt great and completely natural. 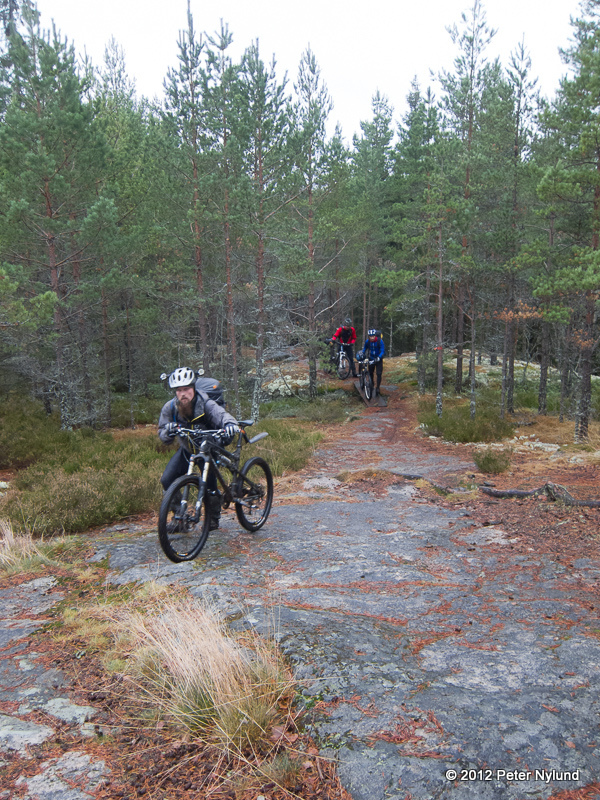 The fourth traditional November beer ride took place this weekend. 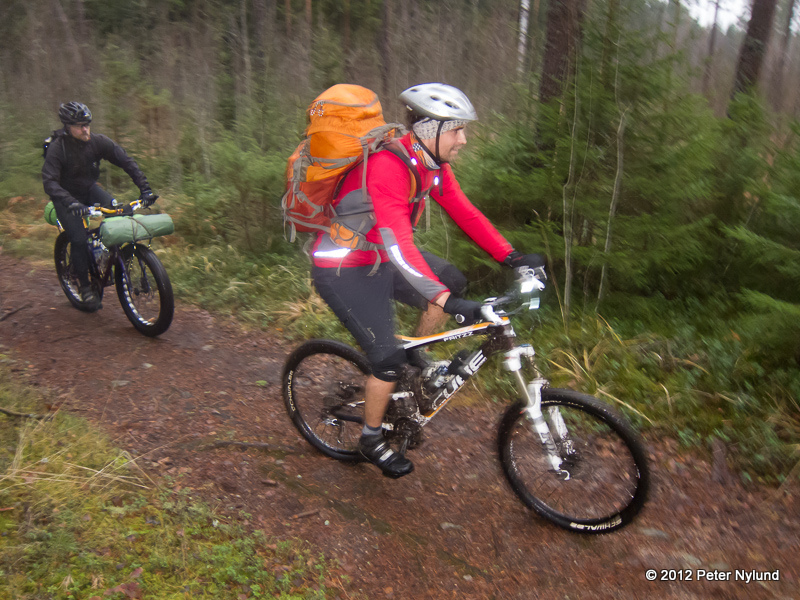 It was pretty much a reprise from last year, both in weather, wetness and this blog post. The weather was also traditional November greyness, though the temperature was a little higher than usual and did not even go close to freezing. 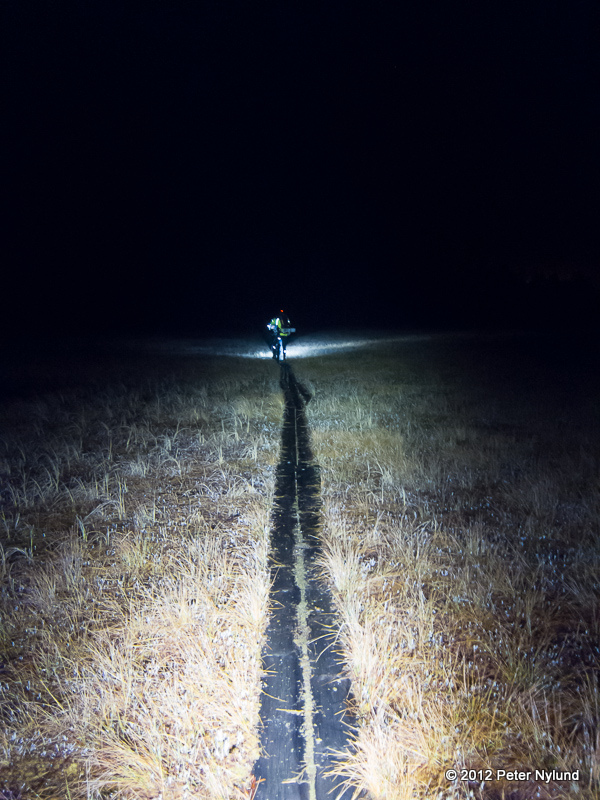 Seven of us started from Rantapiha around 19:30 a Saturday evening. 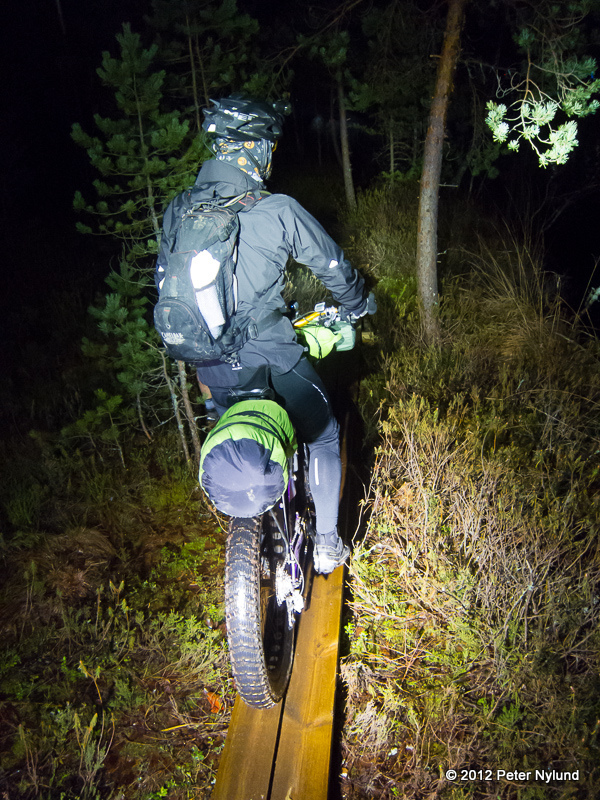 The first section went on the new duckboards north of Savojärvi and was very easy to ride, though there were plenty of opportunities to get wet. 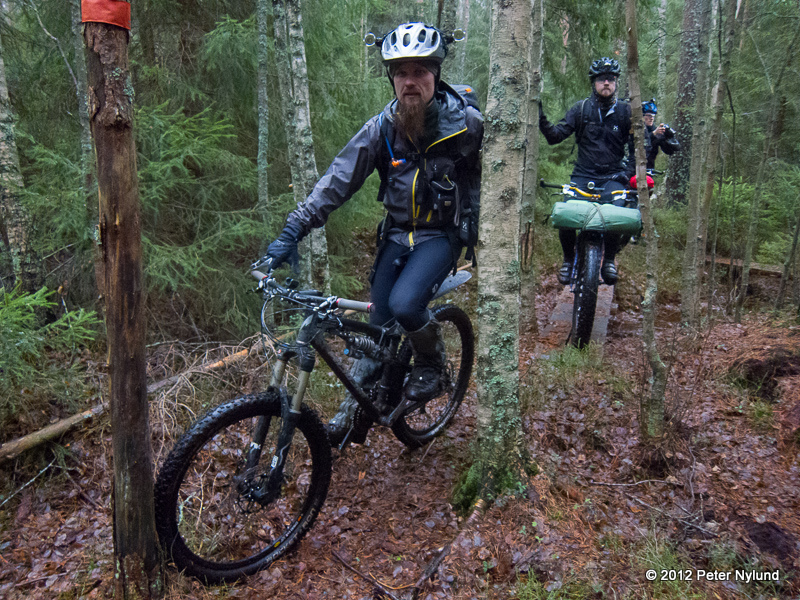 This time we tried some nice trails east of Kuhankuono as well and rode back on forest roads. 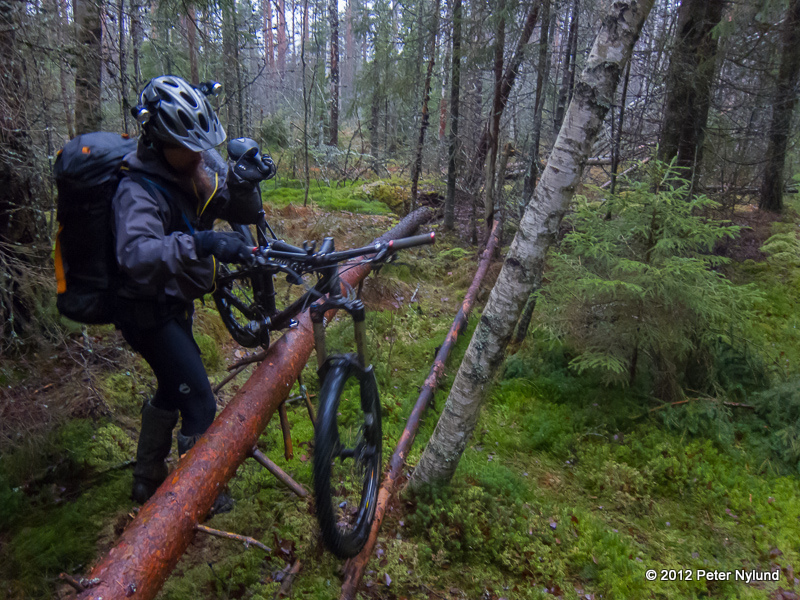 The section Kuhankuono-Töykkälä was more difficult, since the duckboards were in worse shape and also more slippery. 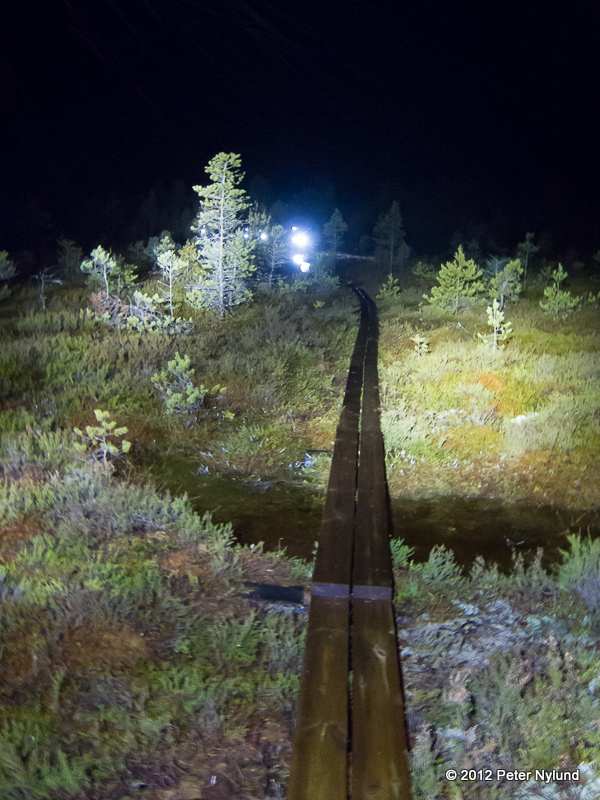 The final section along Vajosuo was technically very difficult, since the duckboards were extremely slippery and also in poor shape. 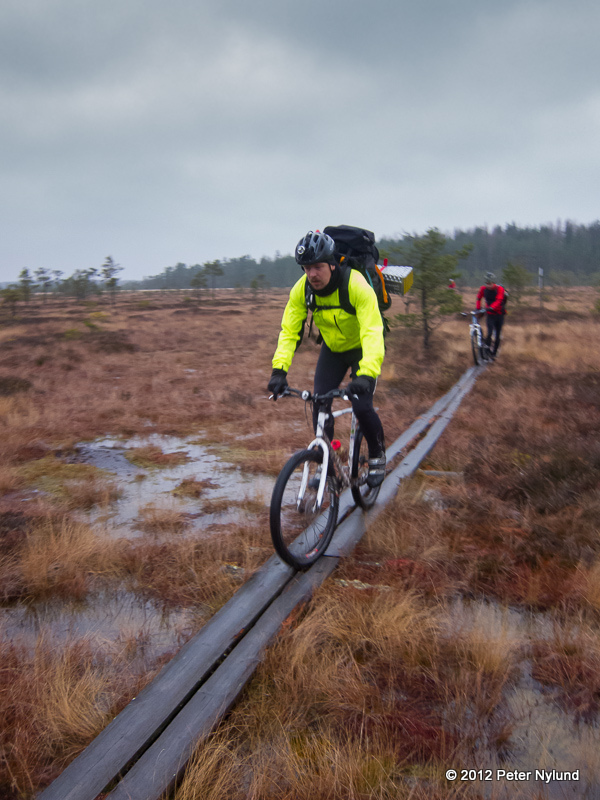 I managed to stay dry, but a few other experienced closer contact with the bog water. 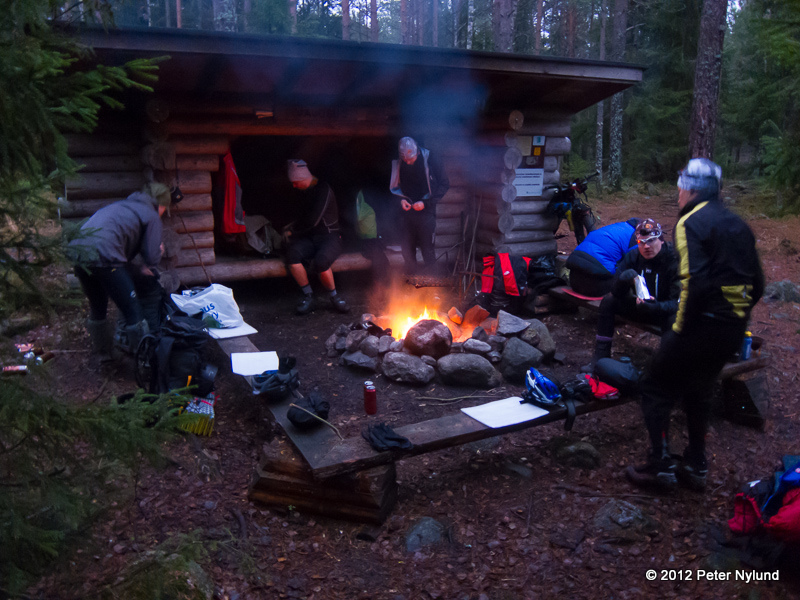 At eleven in the evening, after a little over three hours of riding, we arrived at the Vajosuo shelter, where Toni had just arrived, riding straight from Paimio. 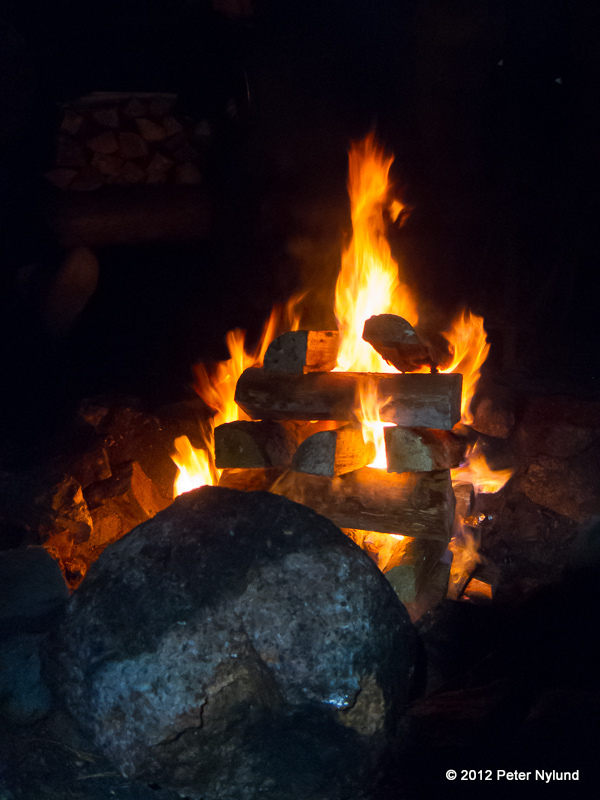 JJ started the fire, as usually, and soon we had a nice fire going. 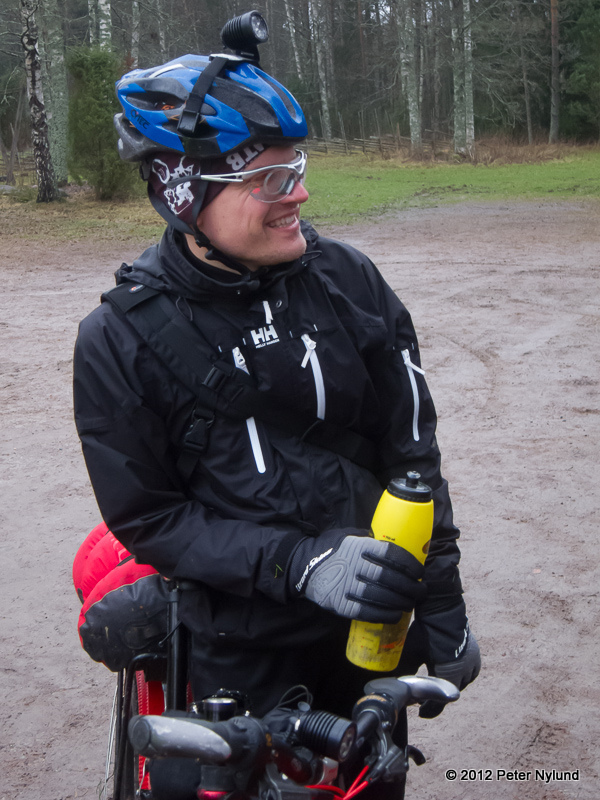 There are many ways to transport beer, and taping beer bottles to the frame is perfectly acceptable.This time a small tragedy occurred, though, and one bottle started to leak. 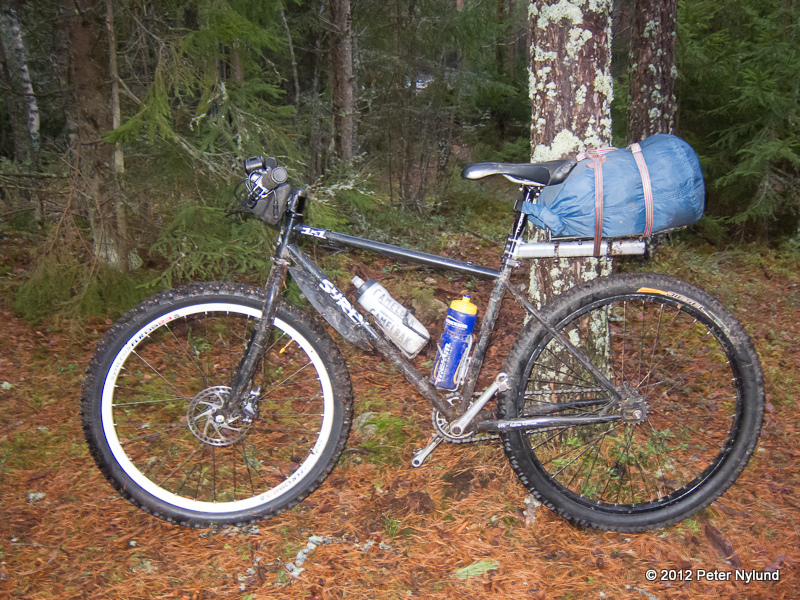 Matti H:s legendary rigid singlespeed (Surly 1x1) was almost radiating. 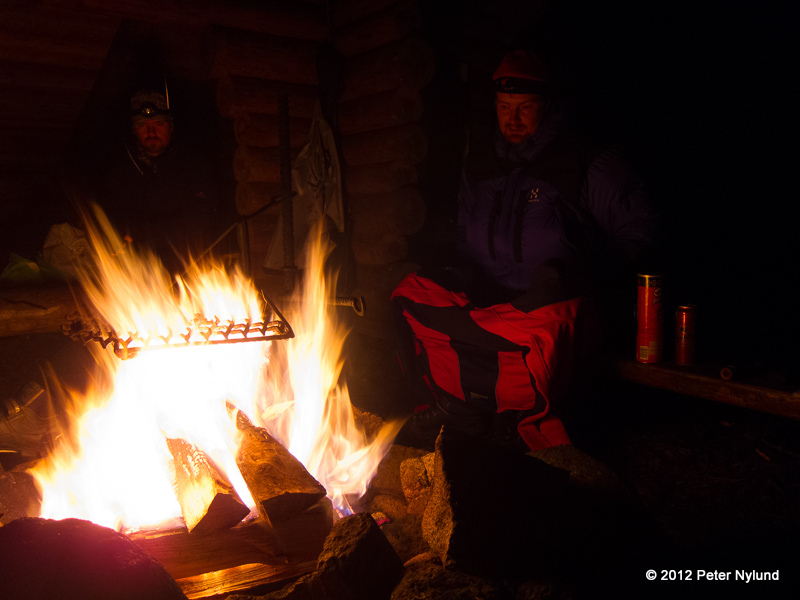 Ordinary Finnish sausage no longer suffices. 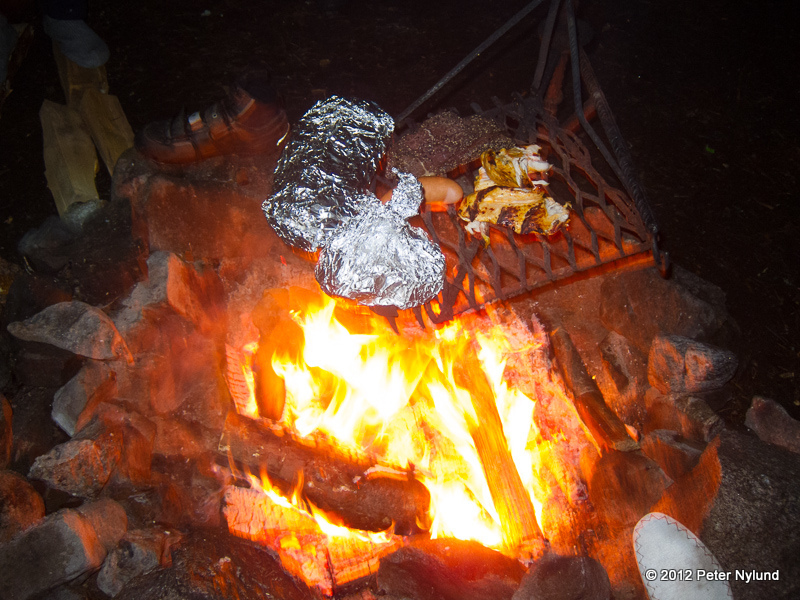 The rest of the evening went grilling stuff, chatting and drinking beer and some stronger antifreezing agent. All very civilized, though. 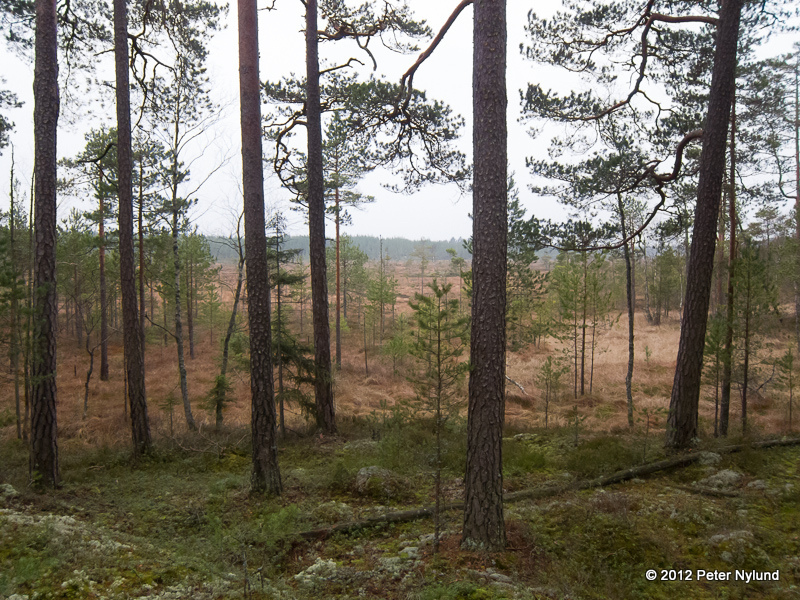 We took the walk to the bird watching tower and afterwards it was time to sleep. 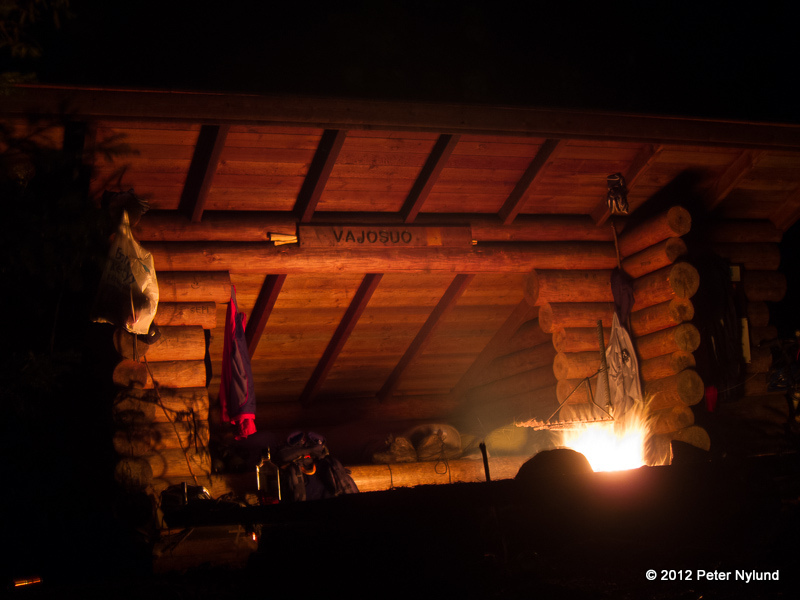 My sleeping spot. 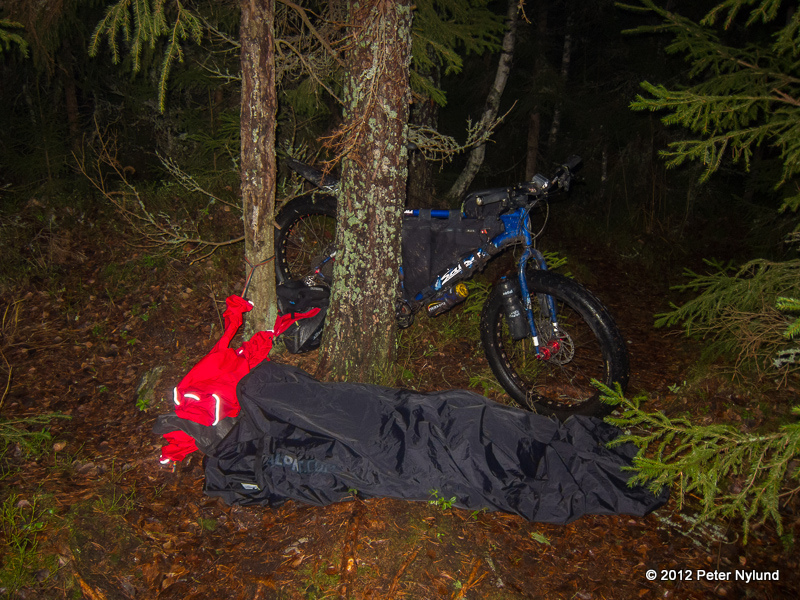 I rigged the rain coat to cover the head, in case it would start to rain (it didn't), since it is somewhat difficult to sleep when it rains straight on your face. 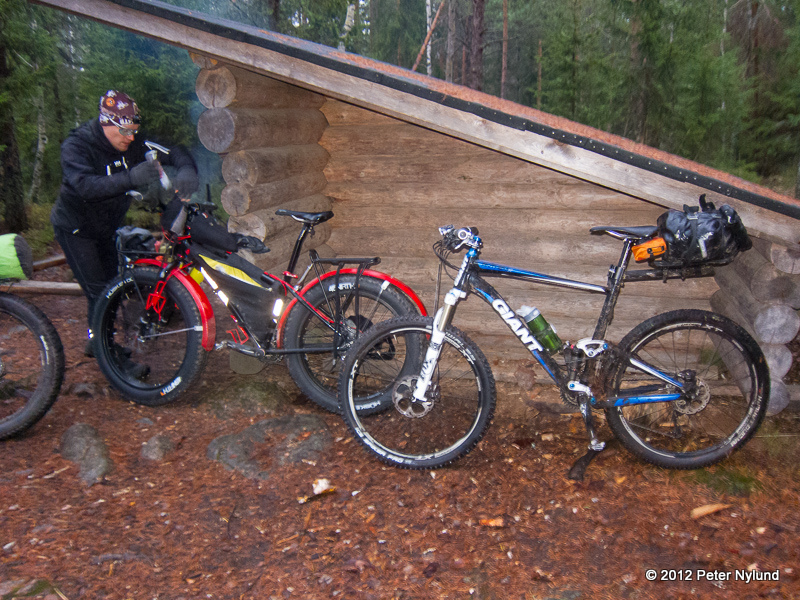 Toni and Matti H also slept in Alpkit Hunka bivy bags. 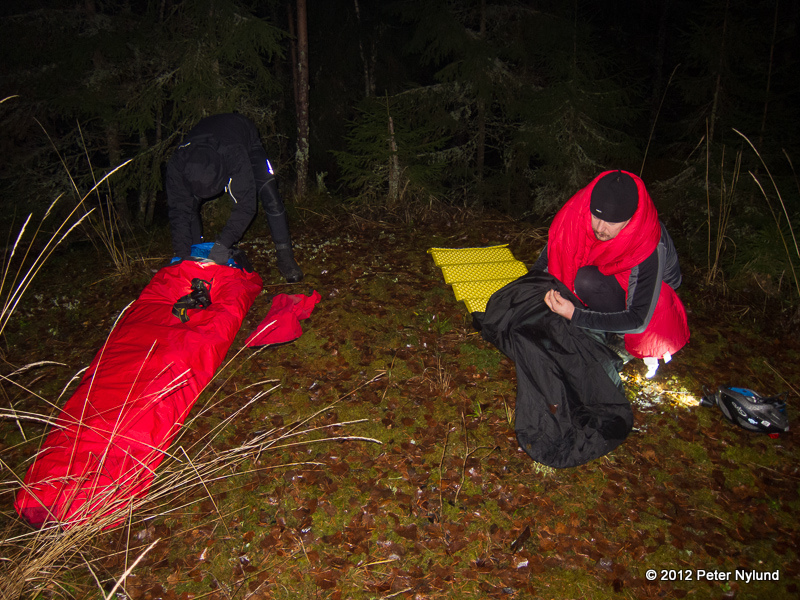 Pihvi had a hammock and the rest slept in the shelter. We went to sleep a little before three in the morning. After a little more than one hour of sleep, I heard a strange sound. 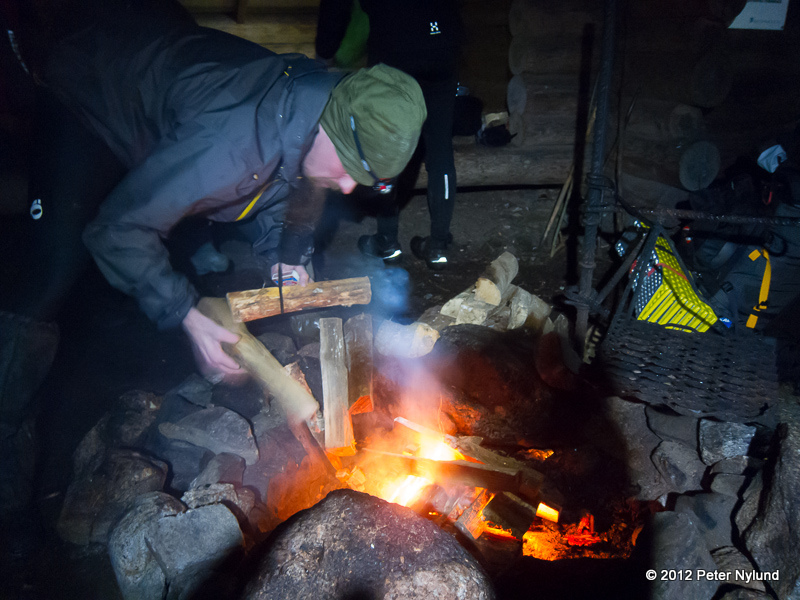 When I peeked out from the sleeping bag, I saw Matti K putting more firewood on the fire. 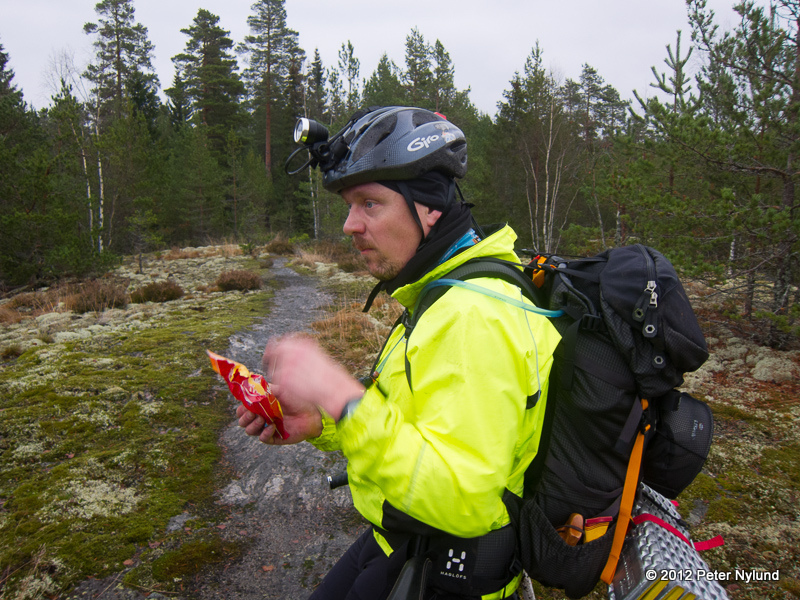 He had started his morning ride early and had ridden from Turku and stopped at Vajosuo for breakfast at 4:20 in the morning. I just continued to sleep. I slept well until 7:30 when I got up. 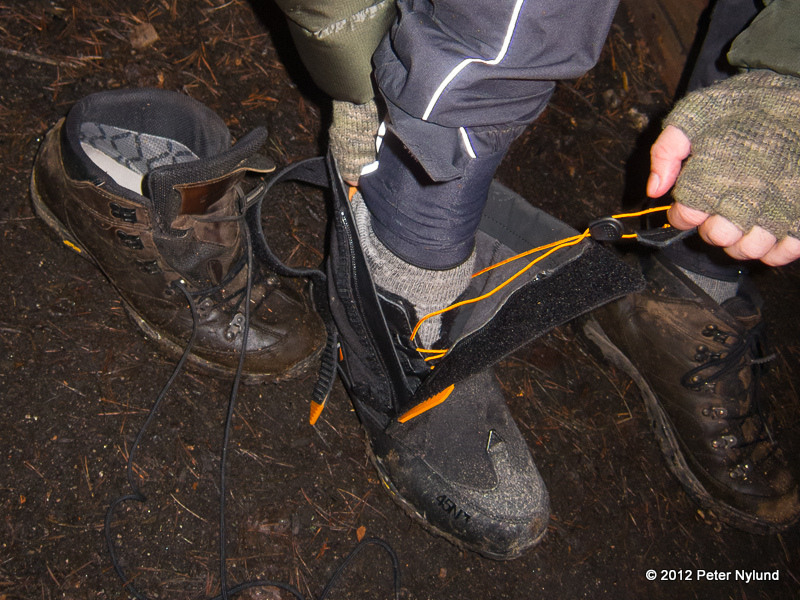 After morning coffee and sandwhiches we started to pack our gear to get going. Another take at the optimal beer ride bike? 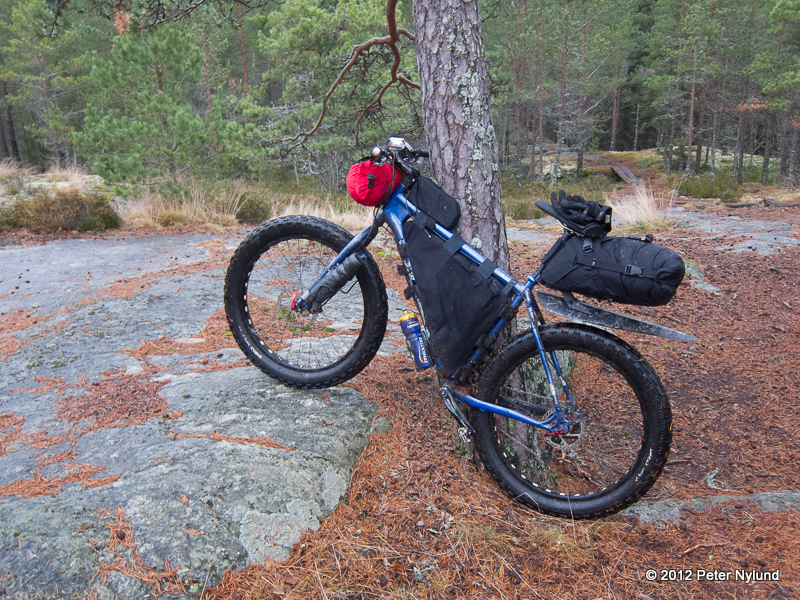 A fixed gear Surly 1x1 ridden by Pihvi. 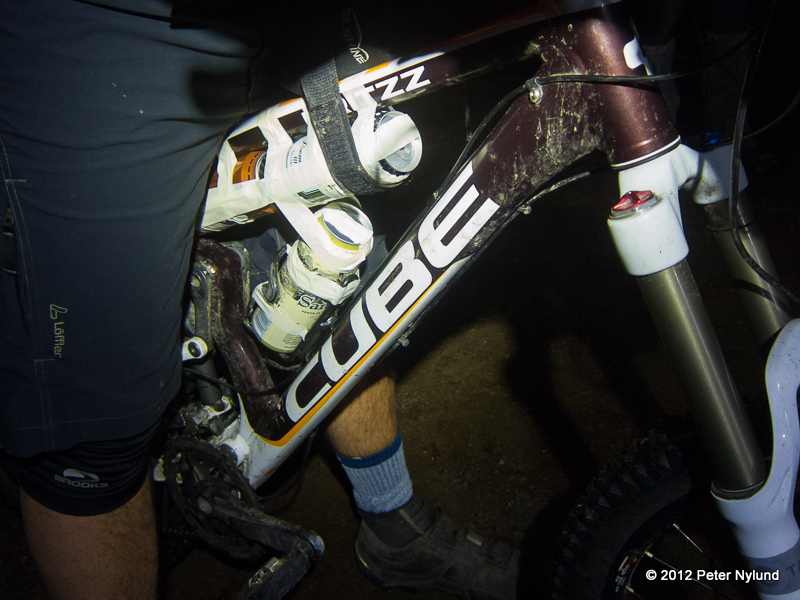 Toni packing his 9:Zero:7 fatbike. 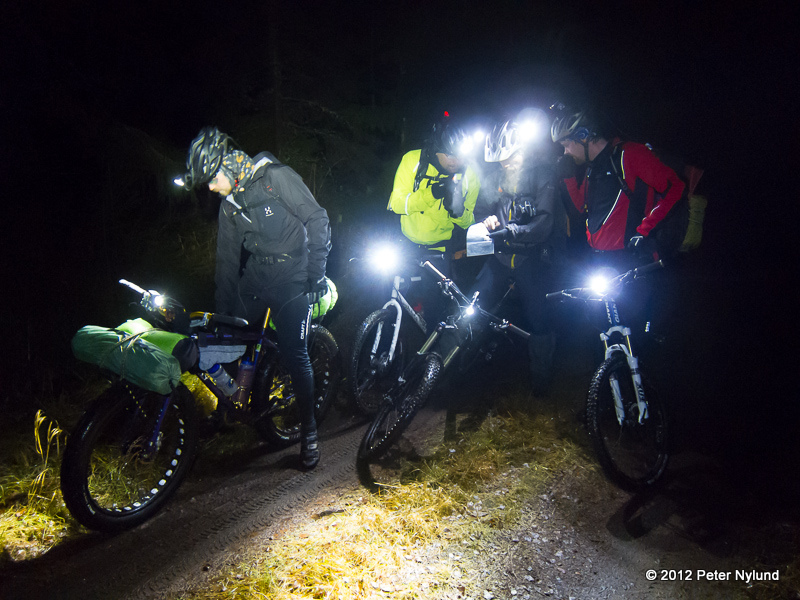 We got started a little over nine o'clock, a little later than expected. 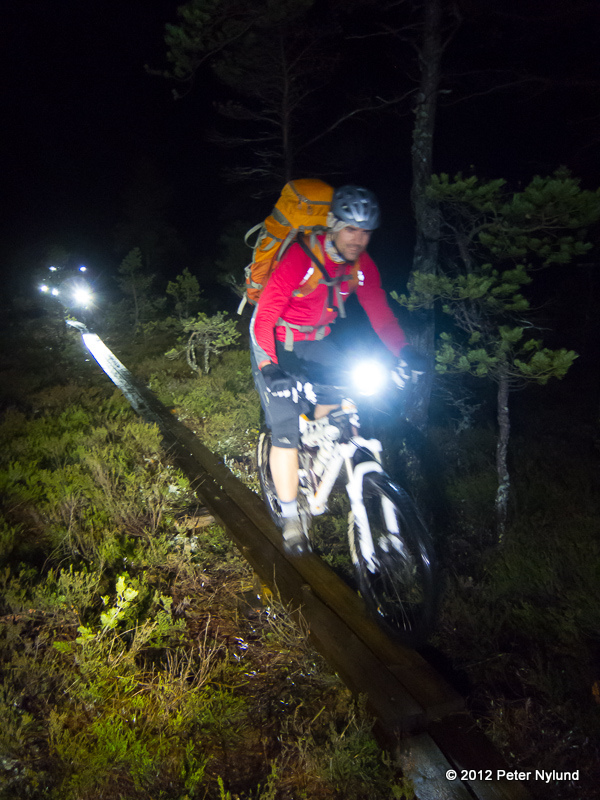 The duckboards of Vajosuo were very difficult to ride. 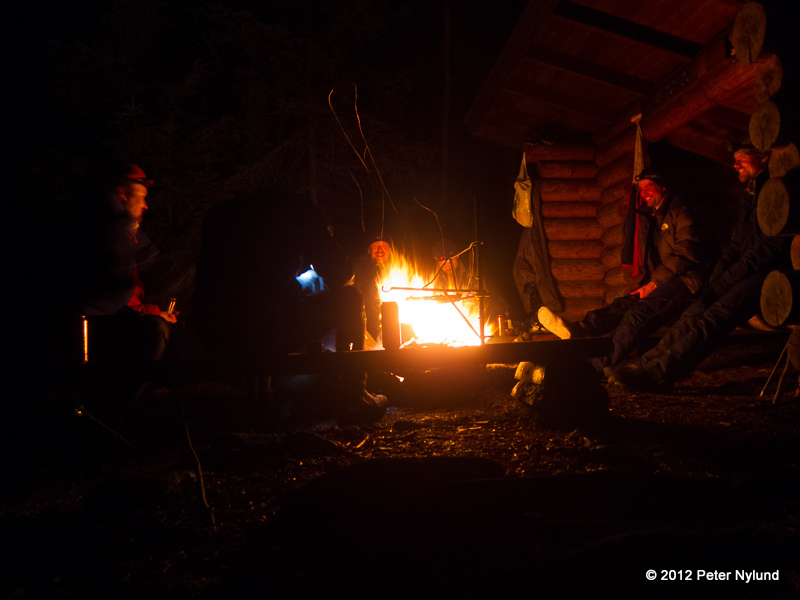 Just a short bit to the Takaniitunvuori break. 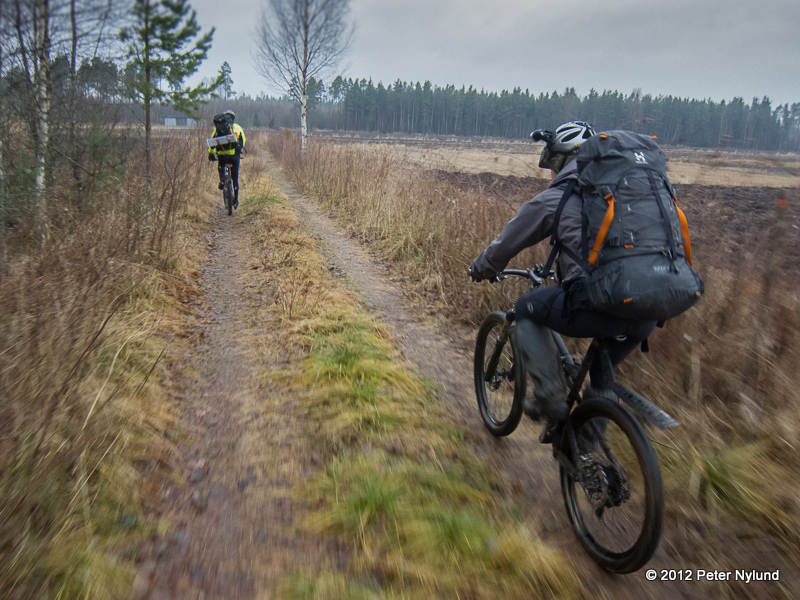 I still think my Salsa Mukluk is very close to the optimal bike for this type of riding. 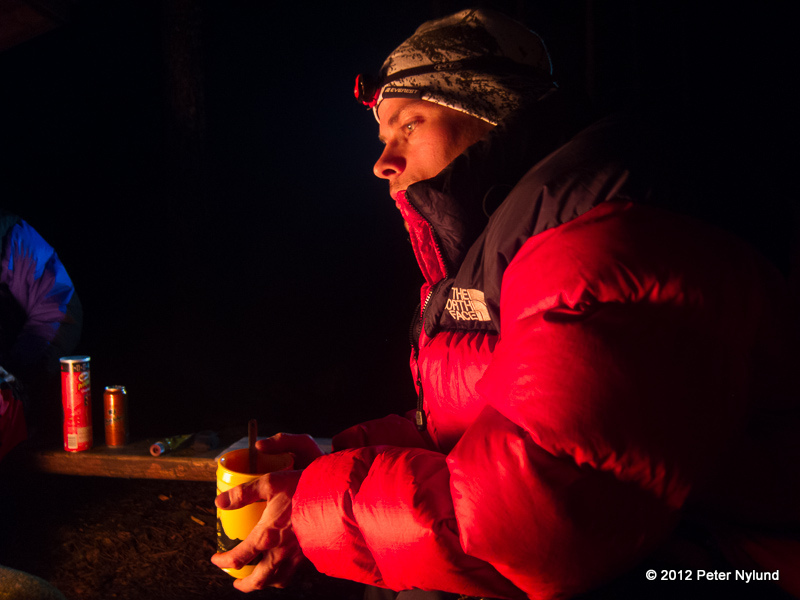 A short overnigher, including some extra beer and food, goes without resorting to a backpack. There was no space for a better camera, though, and I only took a small pocket camera. 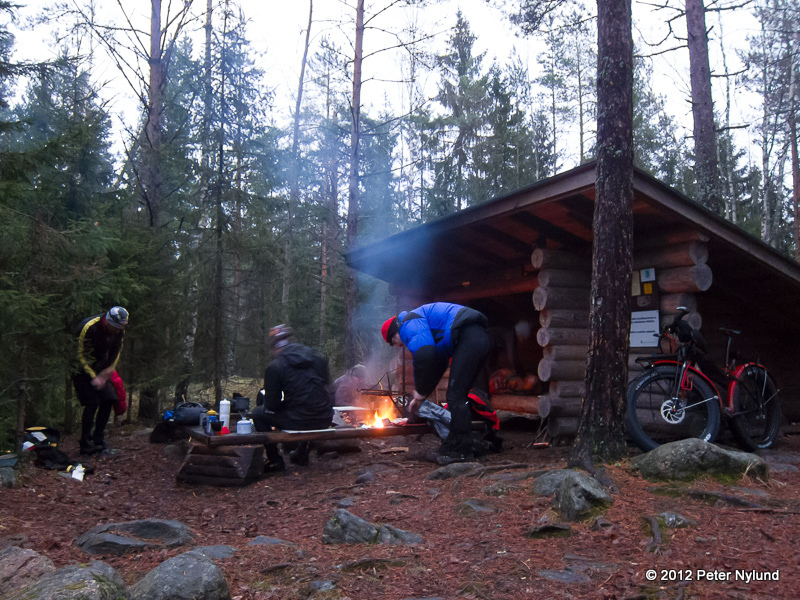 At noon, after a little less than three hours of riding, we were back at the parking place. Toni still had two hours of riding home on small roads. 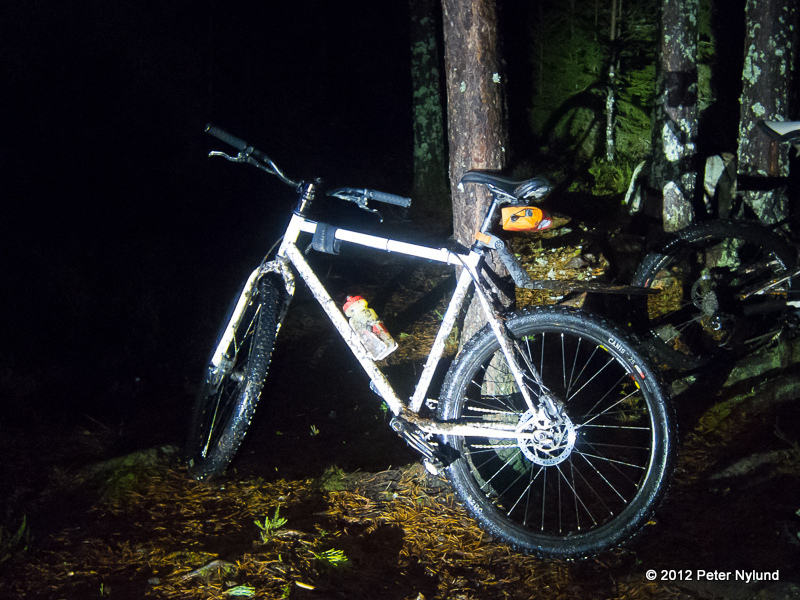 A nice beer ride again. Thanks to everybody for the company. A short video by JJ.